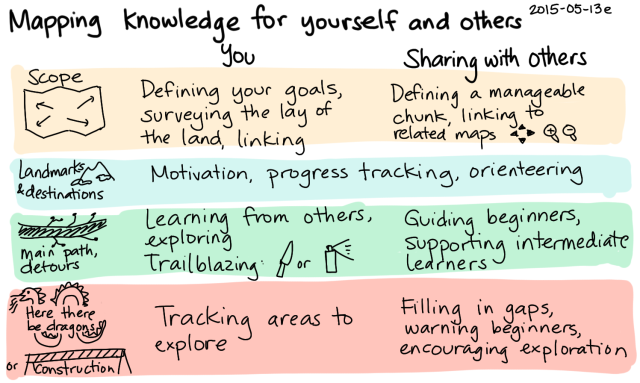 I chatted with someone about maps and personal knowledge management, so I thought I’d write an extended reflection. Scope: What’s included, and what’s not? How does this relate to other things I’ve learned or I’m learning? Main path, detours: How do you get from A to B? Are there interesting places in the neighbourhood? Using index cards, outlines, and chunks seems to be working well for me in terms of current thinking, although I haven’t been turning my attention to organizing, fleshing out knowledge, and filling in gaps. Rough categorization of blog posts: I’ve written some Emacs Lisp code to help me update my blog post index monthly. Hundreds of sketches with few links: Now I have more than a thousand sketches! But that’s okay, I have metadata in the filename, integration in my outline, and eventual chunking into blog posts. No clear picture of follow-up questions, ideas, or actions: Outline still needs work; maybe also a quick way to review open sketches? No clear role models: Found historical and contemporary ones, yay! I want to learn about more than I can fit into my working memory, so I need to take notes and I need to relate those notes to each other. 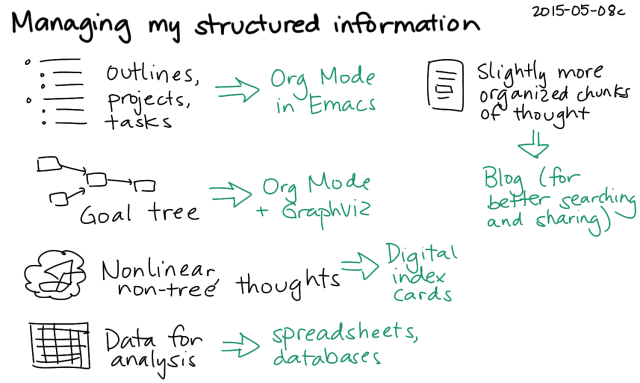 My sketches, blog posts, and Evernote entries are great for remembering things, but I also want to see overviews so that I don’t miss the forest for the trees. This is where mapping comes in. 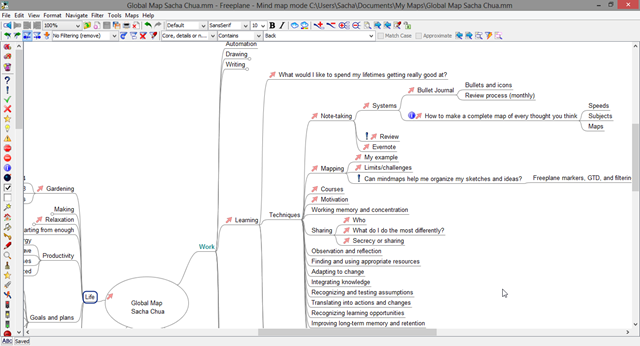 Mapping is about organizing topics so that I can see the relationships, find the gaps, and keep moving forward. 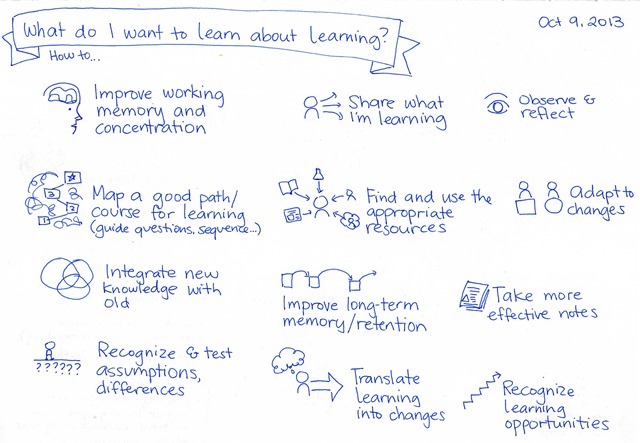 For example, I mapped out what I wanted to learn about learning, and I frequently refer to it while planning my next steps. Mapping helps me look ahead, and it also gives me a framework for connecting what I learn to what I’ve learned before. 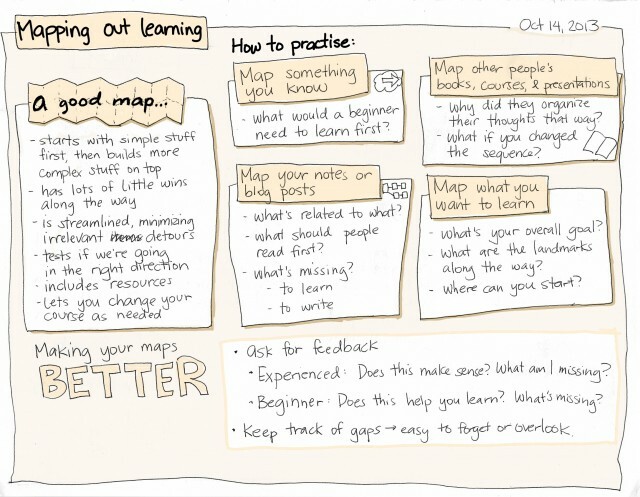 One way to practise mapping is by mapping what you know. This helps you review your notes, identify any gaps, see how far you’ve come, and connect ideas (and discover interesting relationships you might not have come across before). Your maps can also help other people learn. 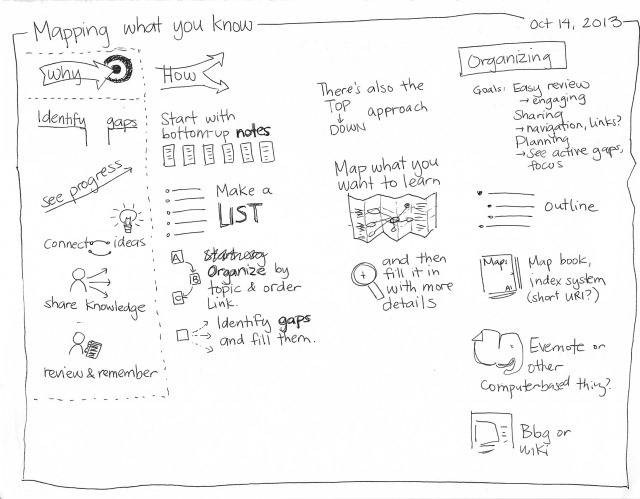 To map what you know, you can start from the bottom level (detailed notes answering specific questions) and work your way up to overviews. Alternatively, you can start from the top (an outline) and then work your way down to the specifics. Combining these strategies can help you get around mental blocks. I’ve been working on mapping what I know. I’m still trying to find a good set of tools to help me do this. Instead of getting intimidated by the task, I’ve decided I’m going to start in the middle, mapping out things I recently learned and things that I’m learning next. 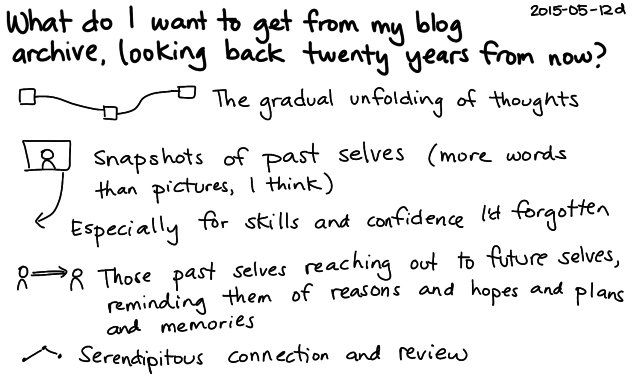 Once I get the hang of doing that, I can start adding older entries like my blog posts. I haven’t quite found the perfect tool yet. 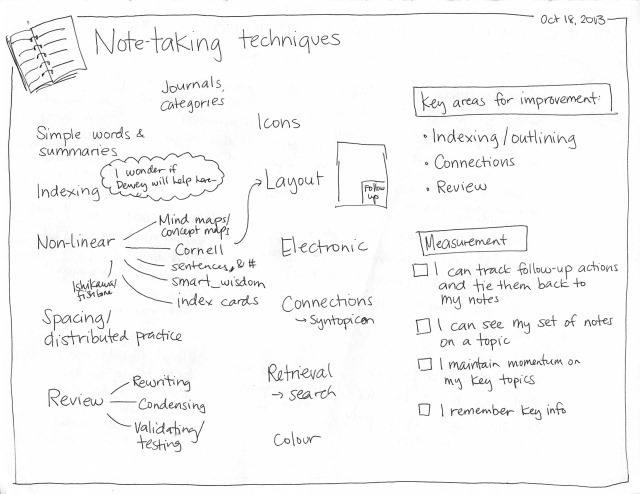 Evernote is great for personal notes, but even though it has public notebooks (see my sketchbook and my sketchnotes), people aren’t used to following or discussing new notes there. Flickr is good for exposure and a little discussion, but it’s not as easy to search or back up. Neither tool is good for overall non-linear organization. 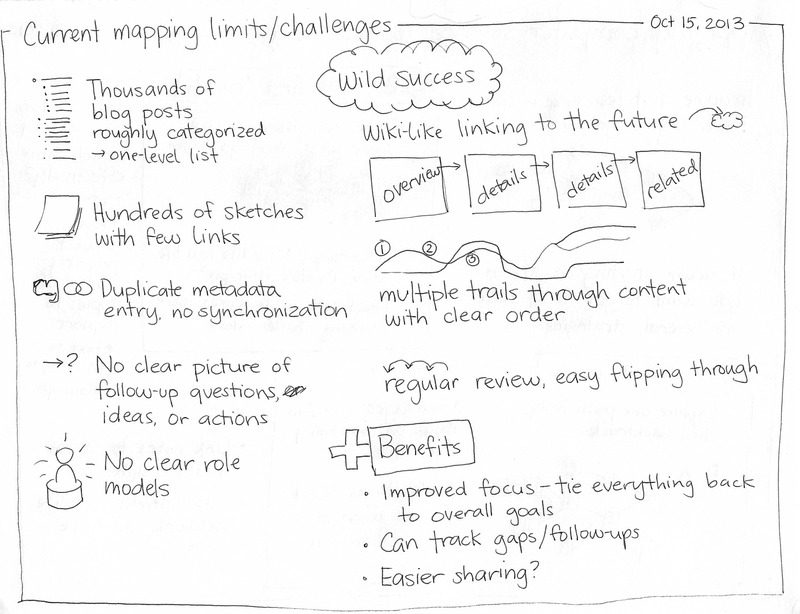 To make this, I added each item in my current public and private sketchbooks to my map, creating nodes when necessary. I don’t have a lot of topics in my sketchbook yet, but if I find myself with more than twenty or so items in a single category, it’s probably time to split that. I’ve split the categories in my blog index a few times, and I’m long overdue for splitting some of the others. It’s much easier to reorganize things in a map instead of editing each item, although I should come up with some kind of bulk interface so that I can update the categorizations. The arrows are hyperlinks to either my blog posts or my Evernote entries (using evernote:// URLs from Copy Note Shortcut). I included private notes as well, so the map works only for me. Sorry! In the future, I’d love to make a version of this that omits private URLs and information. Freeplane supports lots of export formats, so maybe I’ll be able to process XML or HTML and make something that’ll help people browse too. I’d like to get to the point of having a smooth workflow for drawing, scanning, publishing, organizing, browsing through, and following up on these thoughts. Do you know of anyone who’s doing something similar to this? This kind of visual thinking isn’t quite like the visual recording that most sketchnoters do. 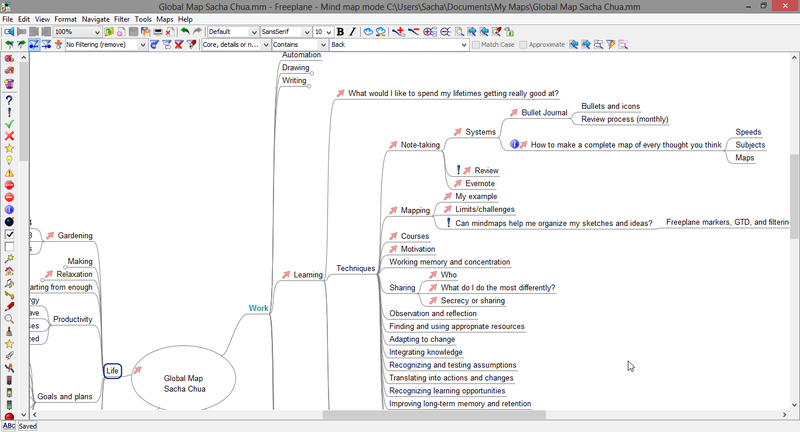 There are plenty of mindmaps at Biggerplate, but they look more like templates rather than thoughts-in-progress. Reaching further back, parts of Leonardo da Vinci’s notebooks are online, and Prof. Carlo Pedretti’s introduction to the Codex Arundel has some notes on the structure: unnumbered loose sheets, usually one page per thought. That’s encouraging, although it doesn’t tell me much about overall structure. Part of Galileo Galilei’s notebooks are online, too. He numbered his pages and usually left plenty of whitespace. There are plenty of examples of note-takers throughout history, but it’s hard to find ones explicitly talking about how they map the connections between ideas. How to Read a Book briefly mentions building a syntopicon, so I checked out the resulting volume (A Syntopicon: An Index to The Great Ideas). It’s a huge project, but it didn’t give me a lot of clues about the process of building such a thing. More recently, there’s How to Make a Complete Map of Every Thought You Think, which described the process of making and updating a global subject map of contents. Books on study skills also talk about how to condense a lesson into successively smaller cheat sheets until you can fit everything onto one page (or an index card, or whatever the teacher permits), and that’s somewhat related to the kind of summarization and overview I want to do. 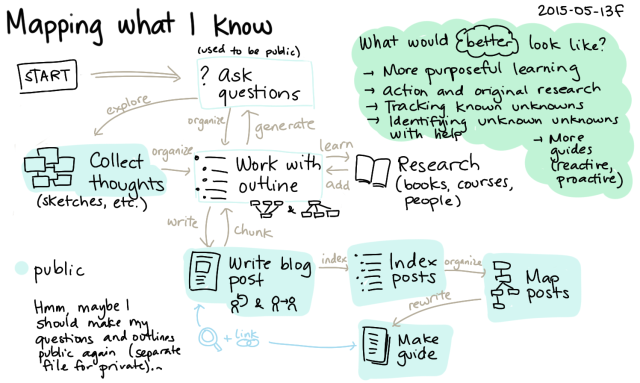 On the non-graphical front, I’ve also had fun making a huge outline of blog posts I want to write (and therefore things I want to learn about). Org Mode outlines work better than Freeplane maps for large amounts of text or fine-grained detail, so I’ll probably switch over to outlines when I’m drafting the post and then update the map with the hyperlink to the post when I’m done. It’s all tied together. Anyway, here we are. I think the sketches and maps I’m making are promising, and I’m looking forward to digging deeper. If you happen to have put a lot of thought into a similar system, I’d love to hear from you!